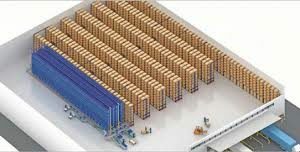 The unique compact design of the Mini Load AS/RS allows you to store more material in less space. These Miniload systems are designed with strong, lightweight alloys making the mini load less expensive to install, operate, and maintain. More specifically, the lightness of these alloys allow for much faster performance, making these machines significantly more productive than their technical ancestors. 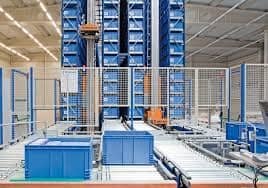 The most common usage of this system is for small parts storage and management for picking and order fulfilment. 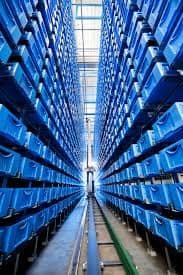 Often paired with a hybrid combination of flow lanes and static racks or shelves, the Mini load provides the best solution for those SKU’s that represent the mid-range of activity. The Mini Load is available in many different horizontal and vertical speeds to match your requirements. In addition, variable acceleration rates ensure load stability. Despite the high speed, the machine is remarkably quiet, operating at usual office sound levels.